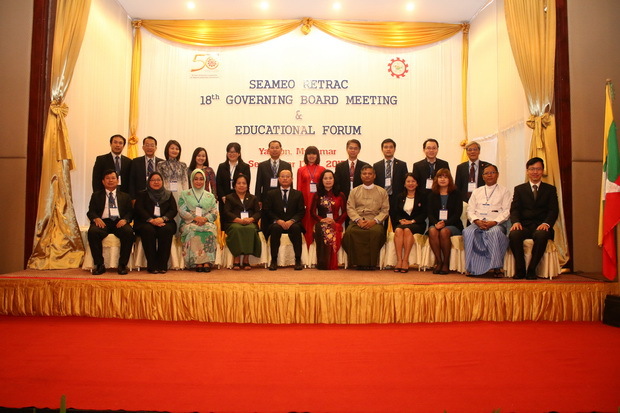 SEAMEO RETRAC’s 18th Governing Board Meeting was convened from September 17-19, 2015 at Kandawgyi Hotel, Yangon City, Myanmar. 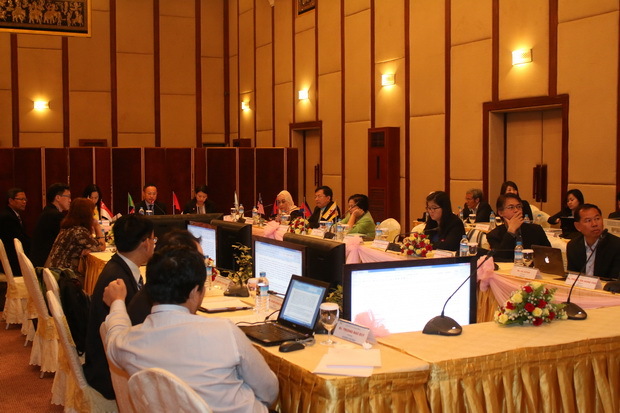 The Meeting was held back to back with the Educational Forum, namely “Education for the ASEAN Integration”. Attending the Meeting were Dr. Nay Win Oo, Deputy Director General, Department of Higher Education, Ministry of Education, Myanmar; Dr. Tinsiri Siribodhi, Deputy Director, SEAMEO Secretariat; Governing Board Members and representatives coming from Southeast Asian countries, and observers. In her opening remarks, Dr. Tinsiri Siribodhi congratulated on the Center’s achievements for the past FY 2014-2015, and encouraged its continued strong linkages with institutions and organizations galore within and outside the region. At the Meeting, Dr. Tinsiri Siribodhi presented a brief report on the agreements and actions taken from SEAMEO Meetings for FY 2014-2015. Then, Mr. Truong Bao Duy, Manager of SEAMEO RETRAC International Development Department, presented a brief report on the main issues raised and approved at the Center Directors Meeting held in Bangkok, Thailand and the Mid-term review Meeting on SEAMEO Strategic Plan 2011-2020. Also, the Board approved the Center’s annual report for FY 2014-2015 and the action plan for FY 2015-2016 which were presented by Dr. Ho Thanh My Phuong, SEAMEO RETRAC Director; the financial report for FY 2014–2015 and the three-year budget plan for FY 2015-2016, FY 2016-2017 and FY 2017-2018 by Mr. Nguyen Tan Hung, Head of Bursar and the first draft of SEAMEO RETRAC strategic plan for the next 5 years 2016-2021 by Mr. Than Trong Minh, Head of Department of Quality Assurance and Branding. The Board Members unanimously approved the Center’s annual report, financial report and first draft of strategic plan. The Meeting ended with the endorsement of the proceedings. 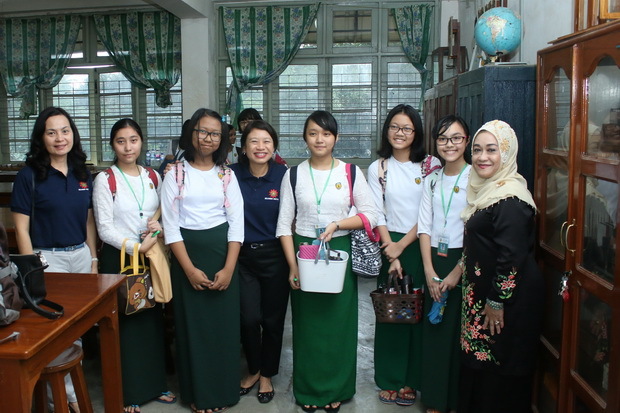 This year’s Meeting also included the visit to Practising High School in Yangon in the afternoon of September 18. 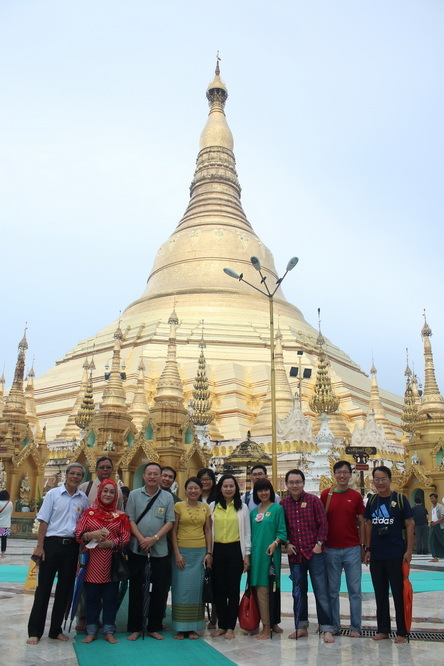 After the Meeting, the Board Members joined a city tour to popular places of interest in Yangon on September 19.